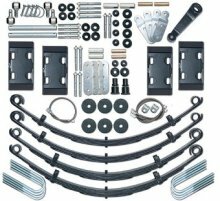 CJ Extreme Duty Suspension kit fits 1976-1986 CJ5, CJ7, and CJ8. Rubicon Extreme-Duty spring-under kits are favorites among the classic die hard Jeeper. These are similar to the YJ kit yet include extra hardware, allowing the use of 2.5" wide springs up front. Whether you are out running tight technical trails, or just cruising the back country with the family, this is the best suspension system money can buy for a CJ.